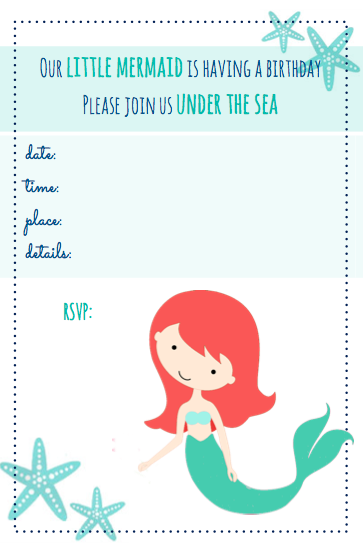 Invitations ($0)–My graphic design student niece Coryn designed me the cute little mermaid, which I then used to design my own invitation. I printed it on matte photo paper I got free at Staples during back-to-school time last summer, then cut it and put them in 4×6″ envelopes I already had on hand. And just because I’m nice like that, I decided to make up some free mermaid printables for you guys in case any of you are planning a mermaid party of your own. You can find them all here. 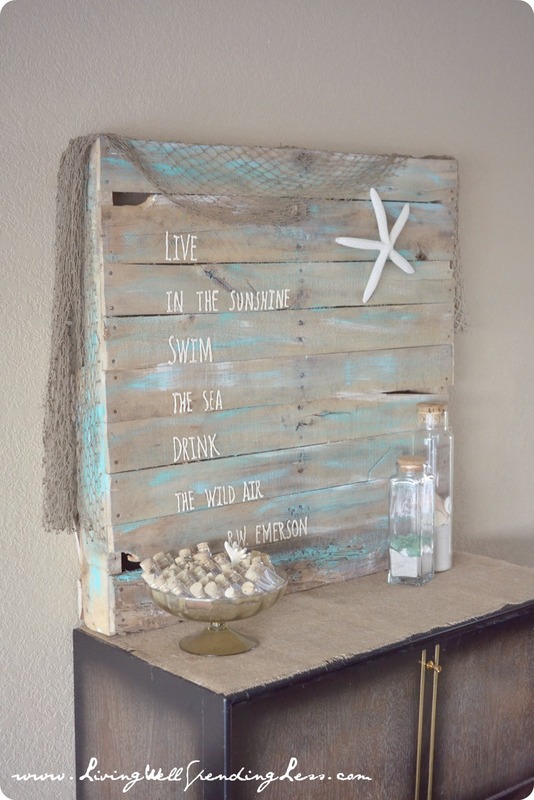 Pallet Projects ($0)–The beachy pallet artwork, “mermaids this way” sign, and the mermaid photo op stand were all built by my husband using old pallets that we picked up for free and a piece of scrap wood he had in the garage. It is so nice to have a handy husband! He carefully deconstructed the pallets then re-constructed for each project. I did all the painting & embellishment, which meant that our only cost for those was basically a few pennies in paint. 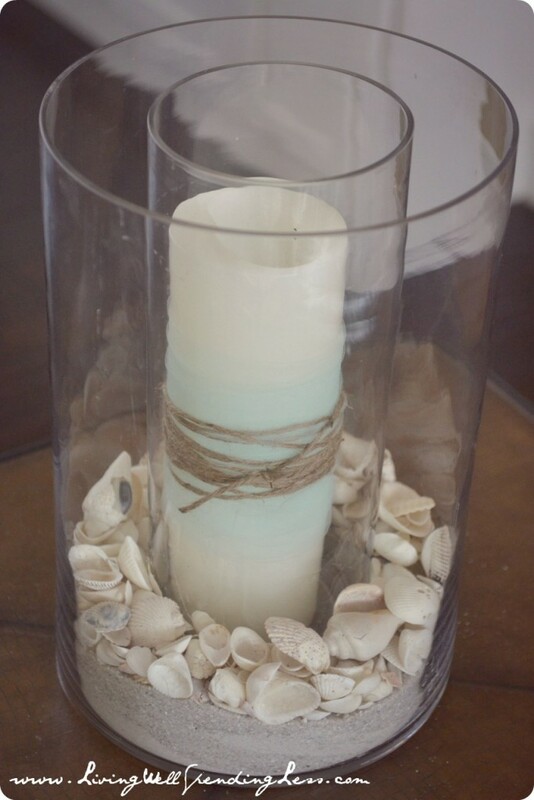 Seashells & Sand ($20)–most of the sand and seashells were collected ourselves at the beach–we do live in Florida, after all–but I did have to purchase a few “fancy” shells and starfish. I found some on Etsy, then found a few more (for cheaper) at a local store. Craft Supplies ($15)–Most of the craft supplies I used for this party were things I already had on hand, but I did have to buy some burlap ribbon for the burlap wreaths, as well as a few bottles of aqua paint. Since JoAnn’s accepts competitor’s coupons I was able to use coupons on pretty much everything! 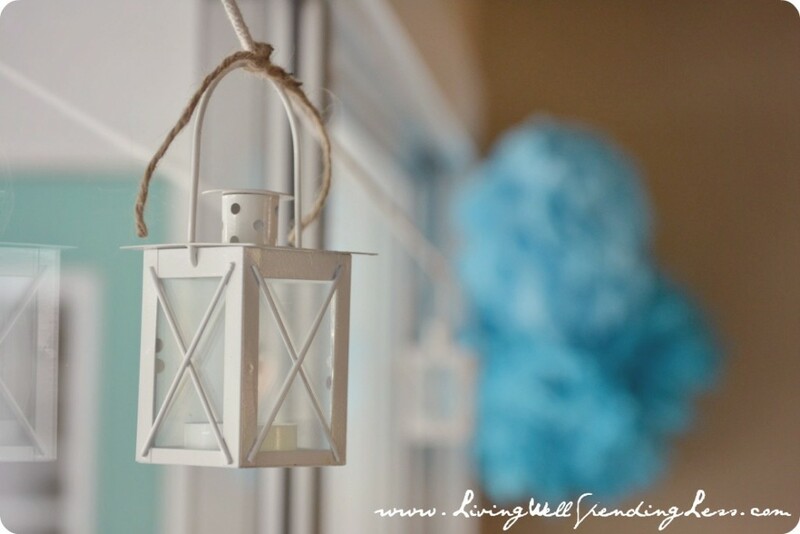 Home Accents ($22)–I bought the galvanized tray & “net” candle holder at TJ Maxx, and then I found 4 corked bottles at a local thrift shop for $0.75 each. Score! The mini lanterns were borrowed from a friend, while the large glass candle holder was something I already had on hand. Table Decorations ($25)–The skirted tablecloth on the round table was not made specifically for this party, but I did sew it myself using Edie’s awesome tablecloth tutorial. The aqua tulle I used on the food table and then again on the chairs outside was actually something I already had on hand, since I’ve been meaning to use it to make tulle tutus for the girls for some time now. I was careful to cut it in the lengths I will need so I will still be able to use it for the tutus! 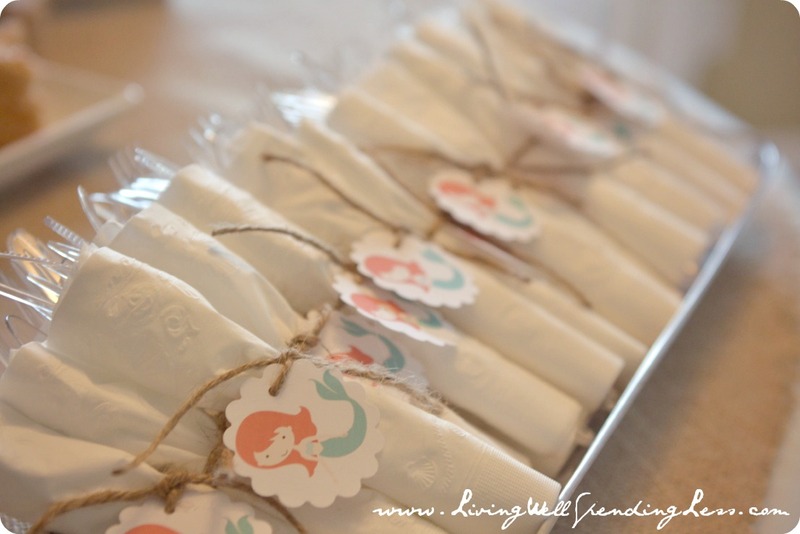 The plastic silverware and basic white napkins were both things I already had on hand, but I jazzed them up by adding some twine (stolen from Husband’s supply in the garage) and some mermaid tags that I printed myself. 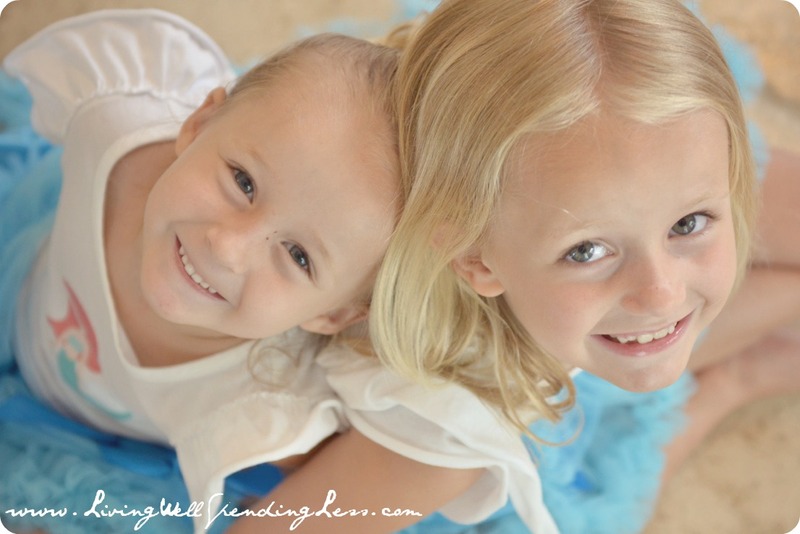 The main expense was this ruffled aqua shower curtain I purchased to use as the backdrop to the table. I hung it with Command hooks and it worked like a charm! 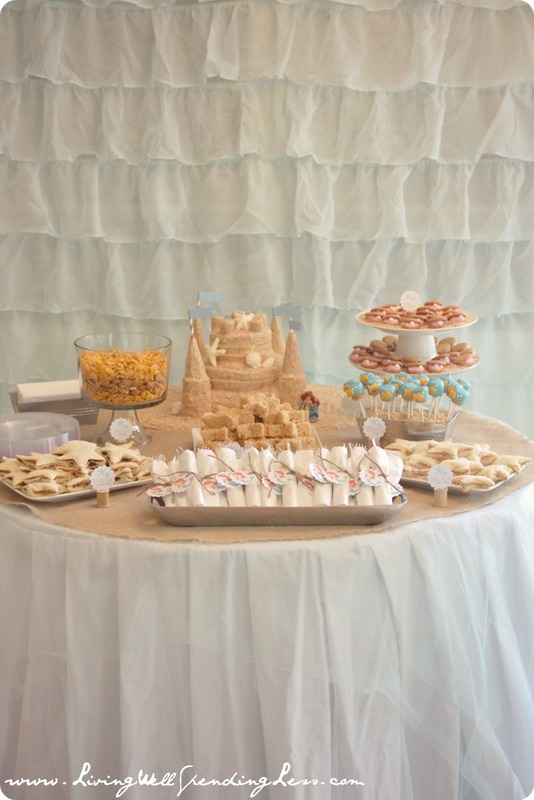 Sand Castle Cake ($15)–The cake was definitely the focal point for the whole party! I was able to keep the costs WAY down because I had almost everything I needed already on hand in my baking stockpile. 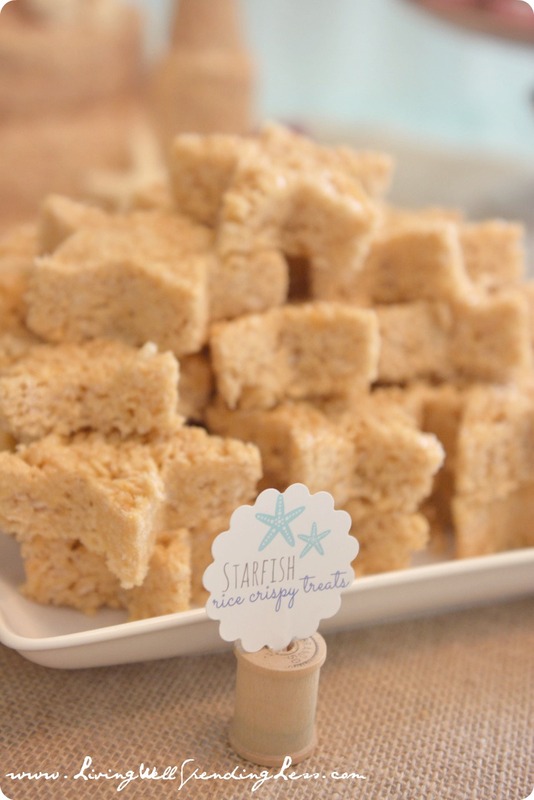 The only things I specifically needed to purchase were this seashell candy mold and this starfish candy mold, as well as some white chocolate candy melts and some butter & cream cheese for the frosting. 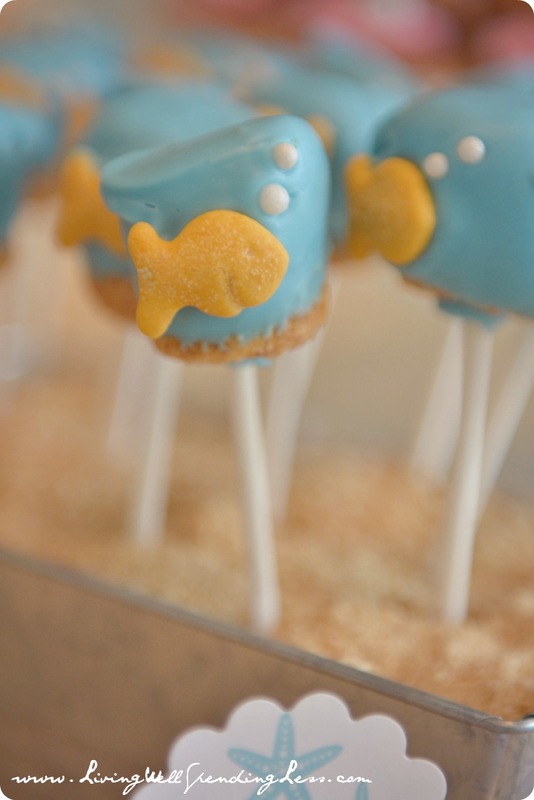 Kid-Friendly Food ($40)–For the kiddos we served PB & “jellyfish” sandwiches, tuna “starfish” sandwiches, starfish rice crispy treats, goldfish marshmallow pops, pretzel & cheddar goldfish, oyster “pearl” cookies, and saltwater taffy. It was all a lot of fun to make, and not too expensive since I was careful to stock up items while they were on sale. In fact, the most expensive part of the kids food was the saltwater taffy from a local candy store! Drink Station ($10)–As usual we served homemade lemonade made from our own lemon tree. The plastic “mason” jars were special-ordered several years ago (from a wholesale container store) just to use for parties, since we have a very strict no-glass policy around the pool. We have gotten SO much use out of them since then! The paper straws were ordered from Etsy. 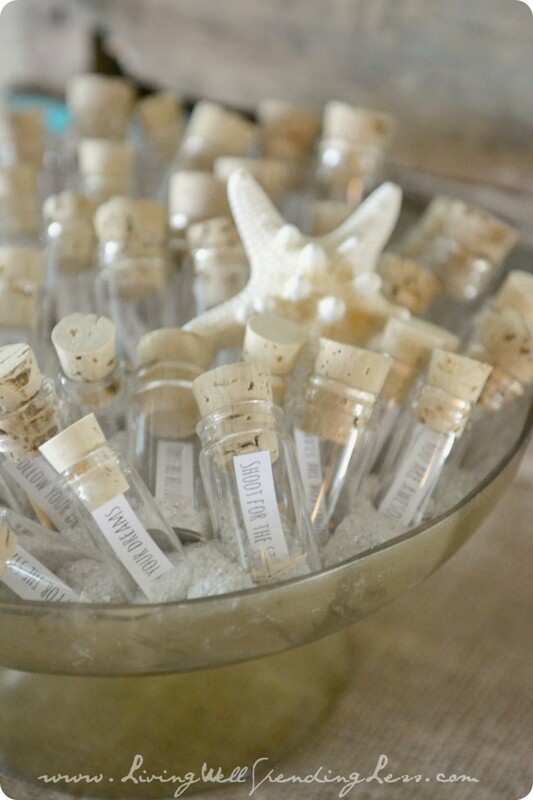 Favors ($20)–Rather than goodie bags, this year we opted to give out little “messages in a bottle.” The mini corked bottles were a daily deal on Pick Your Plum. Finally, for those of you who are wondering (and since I get asked about it almost daily on the post I wrote about taking my kids’ toys away), we are very adamant about our birthday parties being gift-free. Thankfully our friends know us well enough to honor that request! While Trouble received lots of very sweet cards (that she loved), she was thankfully not overwhelmed by a huge stack of gifts, and she was just super excited about being the birthday girl. 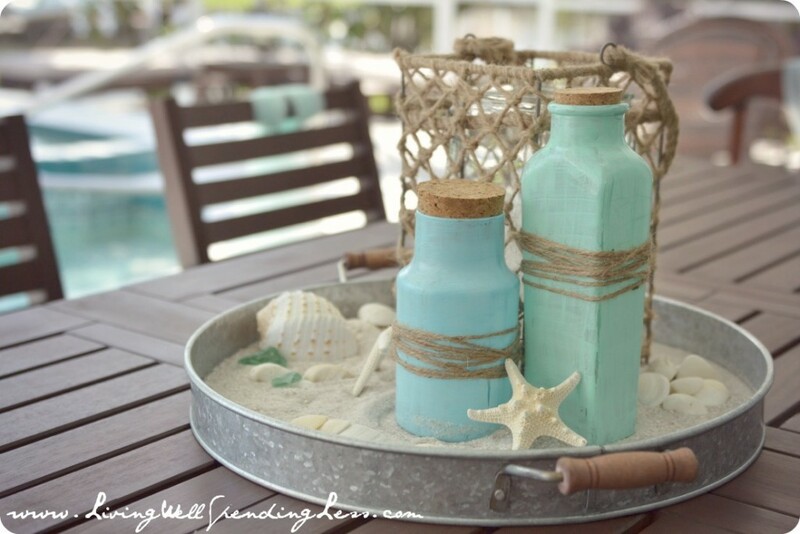 What do you think of the beachy mermaid theme? 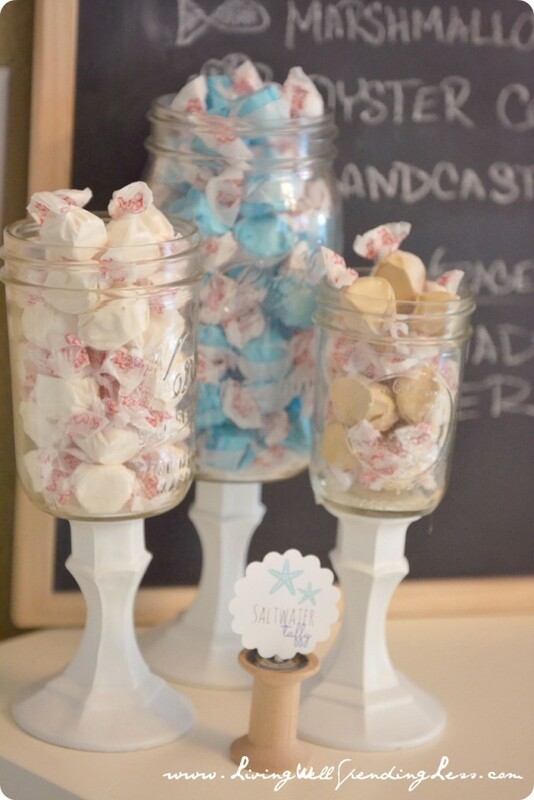 How do you maximize your party budget? 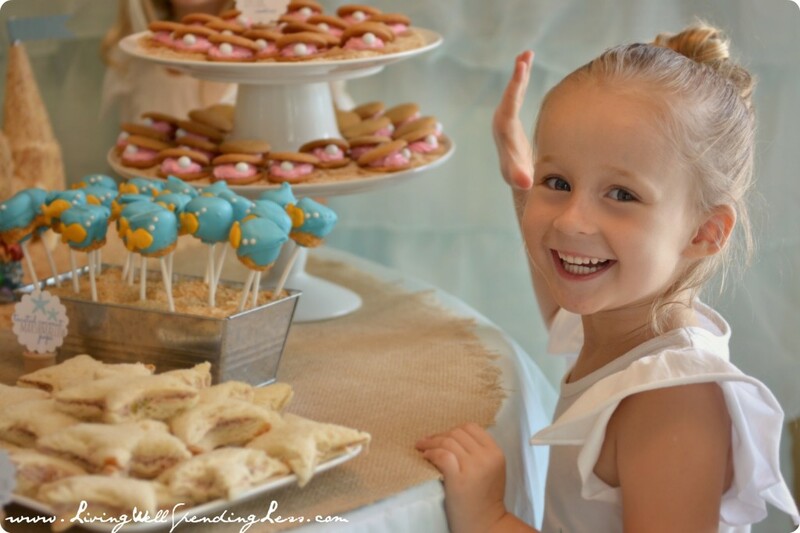 What a gorgeous and fun party! 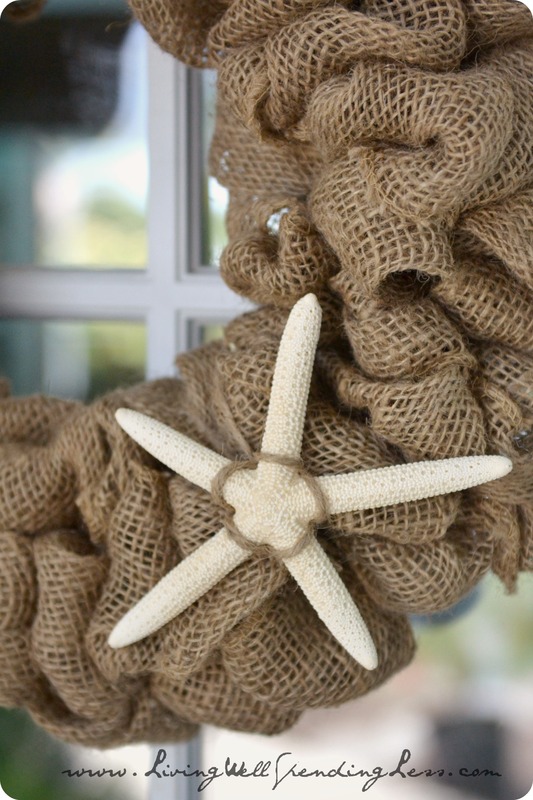 So pretty and love how you will be able to use the decorations in your home decor. Perfect. WOW. Just wow. 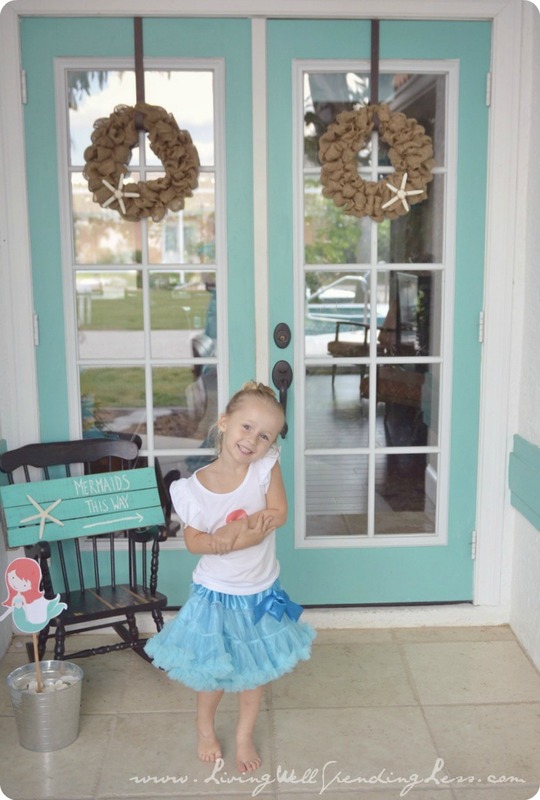 Trouble is one lucky little birthday girl! With a party like that, who needs gifts? Ruth, so cute! Just love the pallet art, the messages in a bottle & the tulle! It was a party to remember! Awesome post! 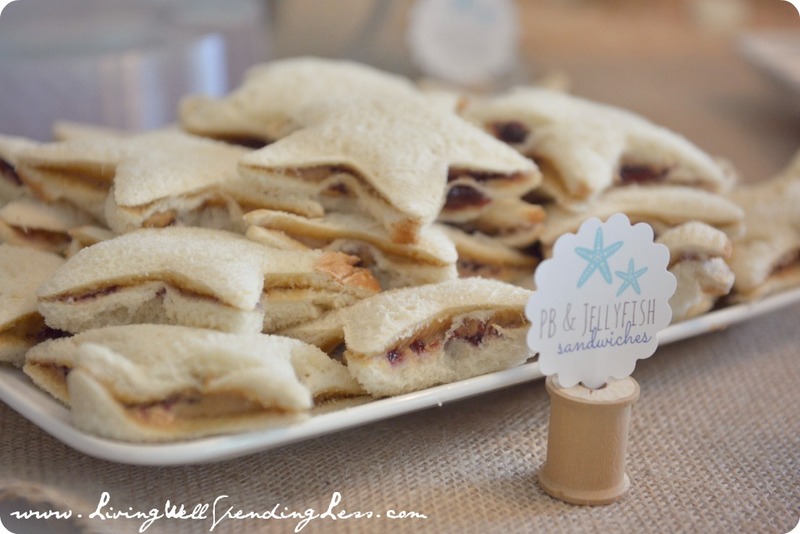 Ruth how do you do the little signs that read “peanut butter and Jelly sandwiches” or the tags around the cultery. What program/punch do you use? They are gorgeous!!! I use one for Mac called Pages. Microsoft Word has similar features though! page conations actually good funny stuff too. This party looks so fun and gorgeous, great attention to detail. Thanks for sharing this. 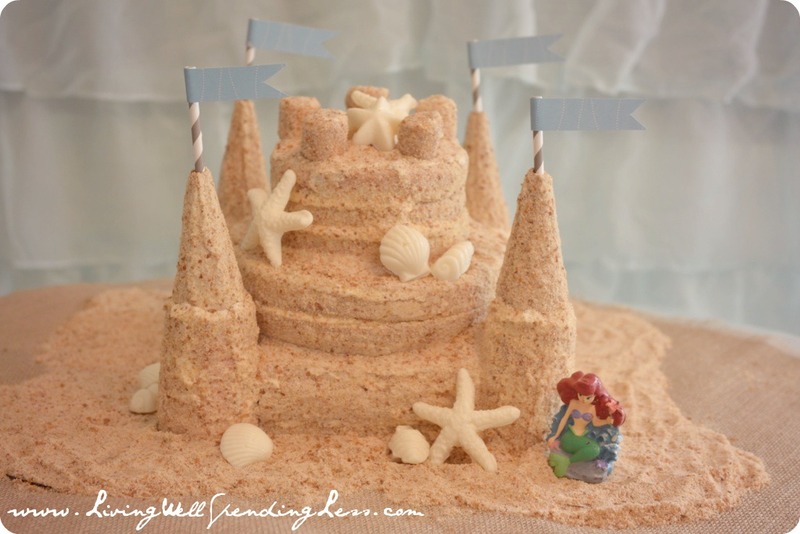 Out of curiousity, how did you make that fantastic sand castle cake? HI! 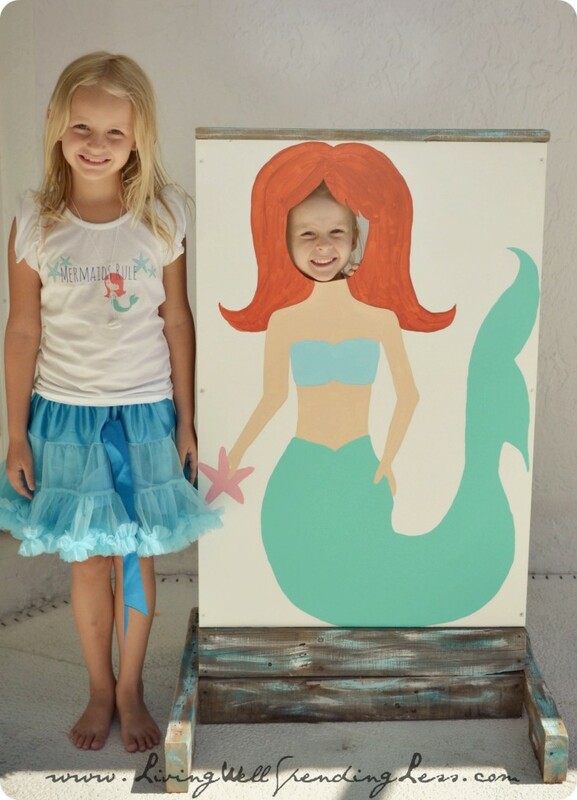 I loved your Mermaid party theme, I’m actually making my daughters party not exactly like yours but she’ll have mermaid also. I was just wondering how you made Troubles sand castle birthday cake?? I LOVE IT! Such a brilliant idea you did, I would also LOVE to make this cake for daughters party. If you don’t mind telling me how that would be really appreciated. Thank you! Hi Shana! 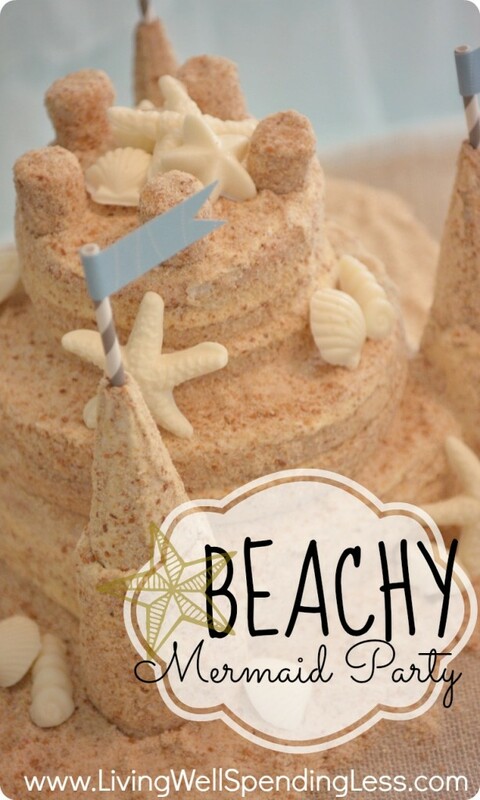 I actually did a tutorial on how to make the cake here: https://www.livingwellspendingless.com/2013/06/12/how-to-make-a-sandcastle-cake-tutorial/ Enjoy! this is an excellent idea..
You have mentioned your homemade lemonade several times in your party posts and I am dyint to try some! Do you have a reciepe your willing to share?? Thanks! 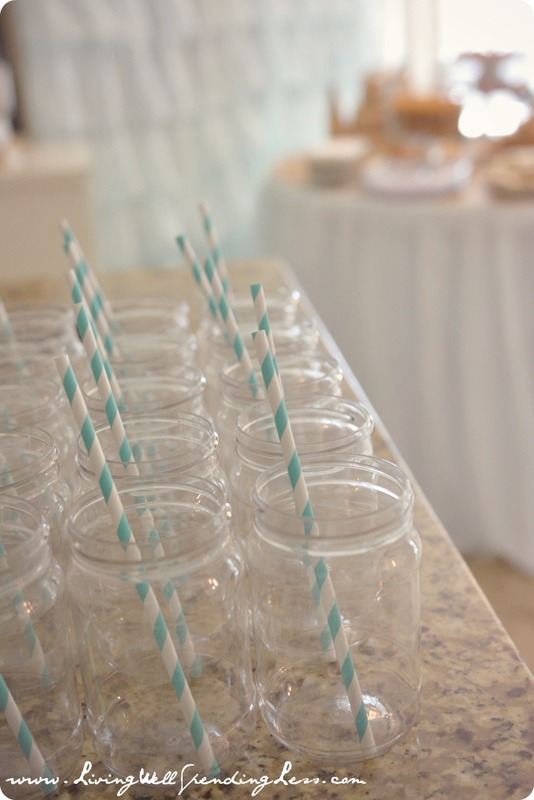 OK- plastic mason jars- wonderful idea!! What is this mysterious wholesale container store you mentioned? I’d love to get some for parties, too! 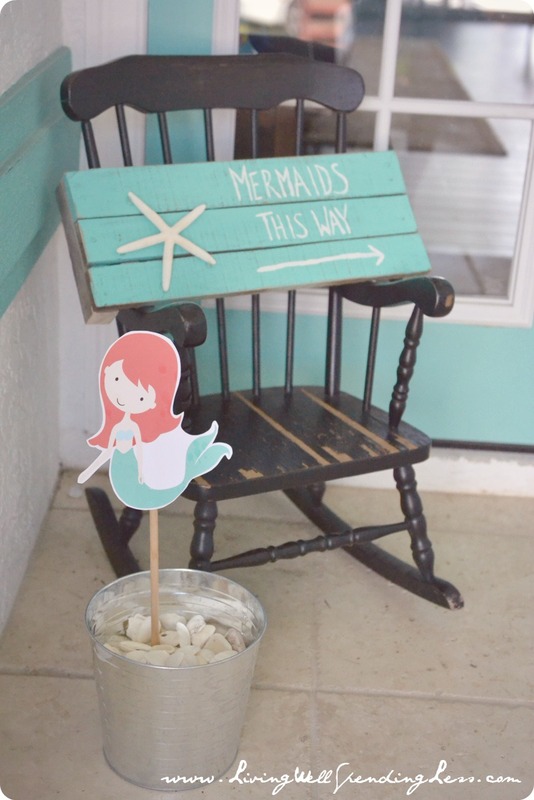 What kind of paint did you use for the mermaid stand? We put the pieces together for this over the weekend, but I can’t decide what paint is best. I just used regular acrylic paint that you get at the craft store because that was what I had on hand. It has now been sitting outside for a year and still looks as good as new! web hosting provider at a honest price? Many thanks, I appreciate it! loads super quick for me on Firefox. Exceptional Blog! 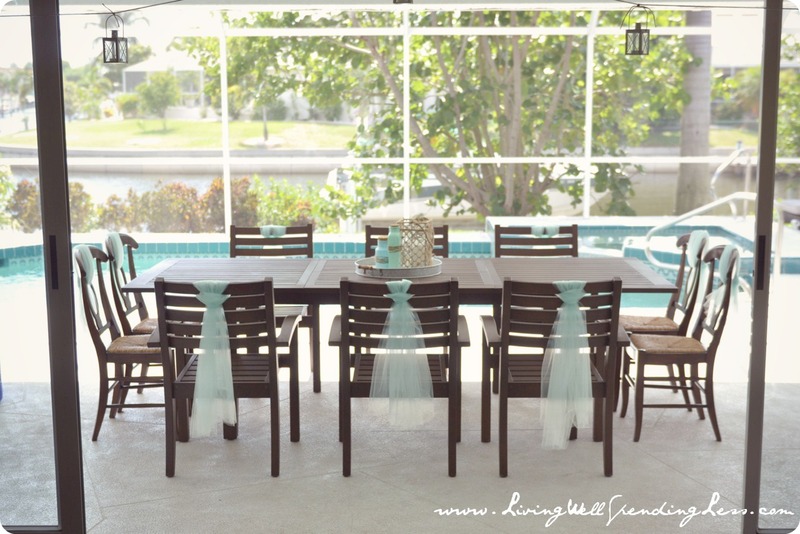 I love the simple tulle ties on the chairs! Would also be an inexpensive way to dress chairs for a wedding. Love everything! 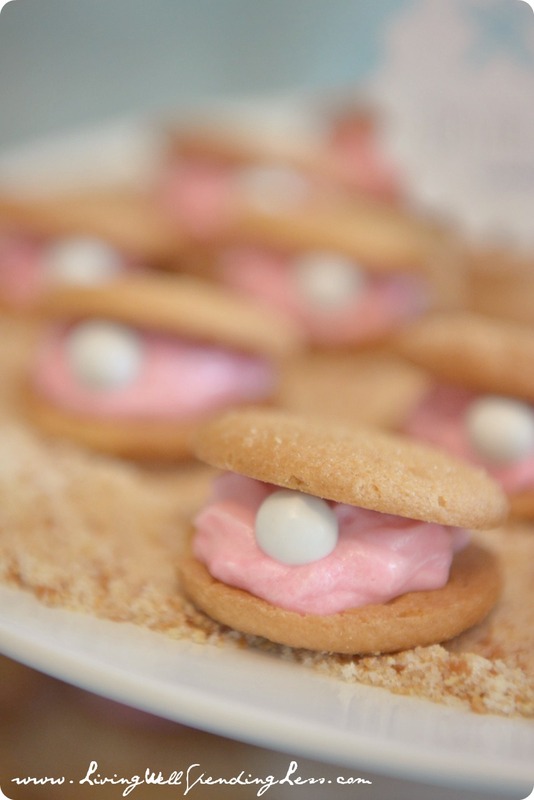 Wondering what you used for frosting to make it look like sand? It’s so beautiful! Having a mermaid/under the sea party here next weekend. 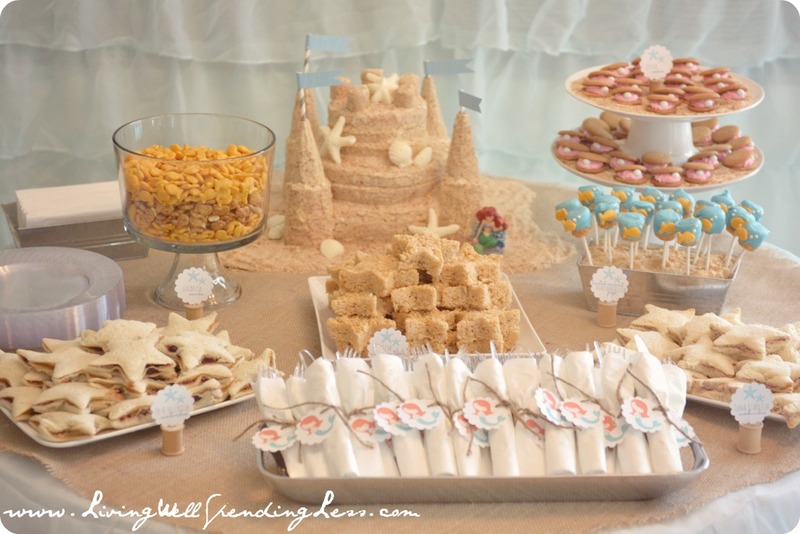 Thanks so much for your printables and sand castle cake idea! We had the best party ever with our mermaid theme, and everyone loved the cake. Very time consuming, but worth the effort for sure. Thanks for sharing. I love these ideas! Exactly what I need for my child’s next birthday party! I have used Invitation In A Bottle before. They have a great product for the very reasonable price.